Malcolm, D., & Majed, M. (2013). Foundation-level Gulf Arab student response to self-access learning. Studies in Self-Access Learning Journal, 4(4), 323-338. This article describes the role of the self-access centre at Arabian Gulf University (AGU) in helping low proficiency students in our foundation year achieve the skills in English they will need to succeed in our medical college. Students’ previous training and expectations are described as well as some of the practices developed at AGU to monitor and encourage student participation in the centre. While students have generally responded well to their self-access work in our facility and endorse its role in developing their skills, they have also highlighted some areas for improvement. Although our centre is small and serves a specialized group of learners, some of the issues we face may be similar to those experienced by others in different settings and some of the solutions we have tried to find may be of interest. For around 15 years now, the English Unit at Arabian Gulf University (AGU), Bahrain, has maintained a facility for students to practise their English skills independently. Originally called the Self-Access Centre (SAC), it has more recently been renamed the English Development Centre (EDC). Although our centre serves a small group of learners in the fairly specialized setting of a medical university, some of the methods we have developed to encourage our students to use the facility may be of interest to managers in larger self-access centres and in diverse settings, as their self-access users probably share many of the characteristics of those in the Gulf. While no one learner is exactly like the next, there are certain commonalities these Gulf Arab learners share, based on previous exposure and training, that may shape their attitudes and motivation, affecting their reaction to self-study. Such factors need to be taken into consideration if we are to facilitate their successful engagement with independent modes of learning. As discussed in Gardner and Miller (2011, p. 87), the implementation of self-access learning is necessarily influenced by students and their expectations, so it is imperative to have a baseline understanding of ‘where they are coming from’ in terms of their prior experience in English language learning. Tertiary education in the Arabian Gulf region, often delivered through the medium of English, is an ever-expanding growth area, with a large number of new private and public institutions now in existence and many more in the planning stages. In Saudi Arabia, for example, ten new public universities have been established in recent years (Onsman, 2011) and, indeed, huge sums are dedicated to the education sector. To feed their governments’ need for qualified professionals who are also Gulf nationals, high school graduates with good academic records are provided with scholarships to continue their education either abroad or in their home countries. At the same time, in those home institutions where the content is taught through English, there is often a notable lack of English proficiency on the part of students that hampers their progress and presents challenges for their teachers. There are many systemic problems affecting the delivery of successful English programmes in public schools in the Arab region in general, including the Arab Gulf region. These include poorly-trained teachers, outdated methodology, an emphasis on rote learning, teacher-centred classes, inappropriate or inadequate textbooks, minimal exposure to English in class, large class sizes and poor assessment methods (Clarke, 2006; Fareh, 2010; Hozayen, 2011; Rabab’ah, 2002; Syed, 2003) . Secondary school classrooms in the United Arab Emirates, for example, have been described as places to memorize textbooks, where English is considered a school subject to be tested rather than a means of communication (Qashoa, 2006). In general, reading is a neglected skill and seen as a ‘pronunciation’ exercise, while the use of libraries or extensive reading programmes are rarely encouraged (Mustafa, 2002, cited in O’Sullivan, 2004). In short, students whose only exposure to English is through public school classes, as is the case for the majority of our foundation students, will have had little exposure to communicative use of the language. They tend to be highly dependent on the teacher telling them what to do, dislike and are unaccustomed to reading for content or pleasure and, in general, take a passive approach to learning. All of this reflects on their training, or rather the lack of it. However, they will also excel at memorizing, be exam-focused and achievement-oriented and motivated to do well in order to pass into the medical years. Understanding these background factors helps us accept the students’ initial response to self-study and put them on the path to becoming more self-directed. For many, being asked to decide what, how, when and with whom to study is a huge challenge but also an opportunity they may never have had before. In order to bridge the gap to tertiary level English medium education, one solution found in almost all post-secondary institutions in the region is to place students in a foundation programme, largely devoted to improving their English skills and lasting for up to two years, until students are able to reach a benchmark score, such as IELTS 5 or higher, that qualifies them to enter the academic field they wish to pursue. Until recently, we had no foundation programme at AGU to help low proficiency students, perhaps due to the relatively small intake to the Arabian Gulf University medical school (around 120 to 150 students a year); thus, they struggled to pass the first year. To address the high failure rate of first year students with low English proficiency, a foundation year was added. These foundation students are now the heaviest users of our self-access facility. Students seeking admission to the university must take an entrance exam, on the basis of which they are assigned to the foundation course or Year One of the medical college. Foundation students are not taught by AGU faculty, but instructors from a private language school contracted for the purpose. English classes are held at the AGU premises for five hours a day, for two 16-week terms, and a specified number of hours of out-of-class work are to be completed in the EDC. Most of the foundation students come from Saudi Arabia, with the next largest group coming from Kuwait, as well as a few from Oman and Bahrain. Nearly 100 students have been admitted to this year’s foundation programme, a tiny number compared to larger institutions, but one that puts a strain on our limited resources and staff. Our self-access centre is not a purpose-built facility, but rather an in-house creation, which means we have had to adapt the resources to the space made available. The EDC is currently housed in a space beside the library, with three small classrooms (one of which serves as the office for the supervisor) and a larger outer room. Furnishings come from the university stores, although some were made specifically for the facility, such as the carrels for watching DVDs (See Figure 1). We have no dedicated budget for the centre, which has meant finding alternative ways to provide resources and update them. While the university administration has generally approved our requests for equipment, getting these orders fulfilled involves time-consuming follow-up, on our part, with university staff. Many of the resources in the facility were ‘scavenged’ from conference trips or during vacations, with the hope of getting reimbursed when brought back to AGU, Bahrain. Thus, we have quite an eclectic selection of materials, including a fairly well-stocked graded reader library, many with CDs, DVDS and textbooks. Hardware includes computers with internet access, DVD players and screens, a wall-mounted TV for movie viewing, games and worksheets (see Figures 2 & 3). Staffing has always been minimal, but a supervisor has always overseen activities in the centre, usually on a part-time basis. When we had no suitable person, instructors took on the role, closing the centre when we had classes or other obligations. Fortunately, for the past two years we have employed an enthusiastic, young Bahraini supervisor, Mohamed, who works closely with the foundation teachers in supporting the students in their self-access study and who has developed a number of activities to encourage their involvement in the centre, as described below. Mohamed is held in high regard by all the students, who respond as much to his personality as to his commitment to improving their English. As a fluent user of English who also shares the students’ own language and culture, he acts as a role model as well as mentor. Students are oriented at the beginning of the academic year in groups of 20. During the students’ tour of the facility, the supervisor explains what material is available, how to plan their time, and gives each student a copy of the EDC rules and regulations. Each student opens a file (plastic folder) in which all work is to be kept, and students are instructed how to fill out the log sheet to record their activities. The files serve as proof of their efforts and also document their progress. Students can go back and see their progress or the teachers may show them, through looking back at their own work. The main job of the centre supervisor is in helping students choose from the variety of activities, to keep them progressing and interested. Students’ behavior and attitude is also monitored and those who are disturbing others will be asked to leave for the day. The number of accumulated hours in each semester is also monitored. Anyone well below the average is advised to seek further guidance or put some more effort into their work. Teachers may check their students’ files, make sure the work is properly documented, look for progress markers and give students extra guidance. Teachers are also responsible for their students’ behavior whenever they bring them to the EDC for special or extracurricular activities related to their class work. Feedback on their progress may be given through written comments in the file, or more detailed consultations with the supervisor or class teacher. Several competitions have been arranged to encourage students to keep working independently on improving their English skills. Prizes (book vouchers) are awarded at the end of each year to the top 5 students. Each teacher nominates the top three in their class and the overall winners are given prizes based on the best documentation and the quality of the work contained in their files. The amount of time logged in self-study work may be taken into consideration when there is a tie, or in cases where it is difficult to choose. Awards are also given for the best student contribution to the EDC. This competition rewards students who come up with an idea or a suggestion to improve the facility. One student received the award for re-naming the centre the English Development Centre (EDC), as students were being teased about spending time in the ‘SAC’. Another student searched for inspiring sayings and famous quotations, posting a different one on a board each week. The awardees usually come up with simple effective ideas that other students engage with. Each year, 10 to 12 students volunteer to help out in the EDC and try to make it as friendly a place as possible. They are trained by the supervisor and help in tidying, keeping students quiet, preventing them from misusing the facility and helping them to operate equipment. 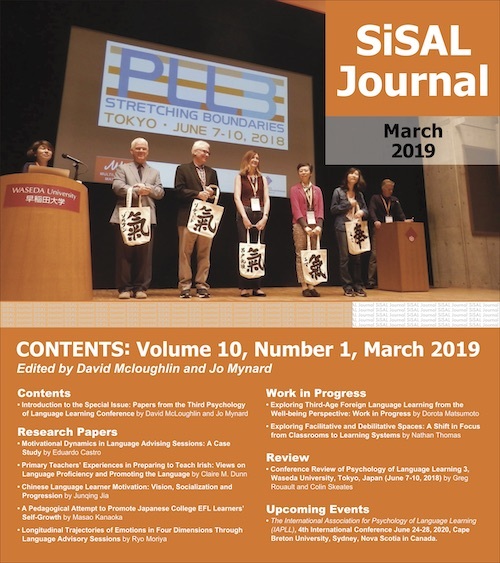 Involving students in the day-to-day working of a self-access facility as volunteers, group leaders or organizers has also been a feature of some very successful SACs in other settings, such as Japan and Taiwan (Cooker, 2007; Shih, 2007). The best volunteers also receive an award at the end of the year, based on the supervisor’s assessment of their performance and on the amount of assistance offered to him and to the other students. The awards ceremony, hosted by the supervisor, is attended by university administrators as well as students and teachers and always generates a lot of interest and enthusiasm (see Figure 4). Further incentives for students include an honours board containing the names and pictures of the top students for each year, and opportunities to visit off-campus museums and historical places in Bahrain, where they are tasked with assignments by their teachers involving reporting back on the activity. These reports are considered in their self-access work, with the added bonus that off-site visits help to promote the centre as they are reported in both the university and local press. “Celebrating success” has also been recognized in other SACs as an important motivator to keep up student enthusiasm, for example, in Uzbekistan, where centre users’ achievements and suggestions are also shared with their peers (Gorevanova & Gulyamova, 2008-2009). Discussion groups are a popular extra feature of self-access learning (see Figure 5). Discussion groups of 3 to 7 students for half-hour or one-hour sessions are booked in advance at a specified time in the centre. Students choose the topic, while the supervisor acts as moderator, advising about language errors, such as pronunciation and grammar. Student-nominated topics are arranged a day ahead, with the moderator beginning with a question, while students continue with prepared questions of their own, each participant stating an opinion at least twice. Discussions may also follow a movie or documentary viewing, in which participants discuss different aspects of the film, such as the plot, characterization, cinematography and the message conveyed. This may then be related to real-life situations students are familiar with and have opinions about. Since the foundation was established, many former foundation students have passed to Year One. Some of these ex-foundation students choose to act as tutors for current foundation students, finding out their needs and designing activities to help them through tutorials arranged in the centre, with the input of the supervisor, and often using its materials. In order to gauge students’ response to working in the EDC, this year a short questionnaire was designed and administered to students who had completed foundation and been accepted into Year One of the medical phase (see Appendix). The 5-point Likert scale questionnaire was distributed in class by Year One English teachers and collected at the next class meeting. The questionnaire contained five questions related to the benefits to the students’ English skills from working in the EDC. One question related to the amount of support and feedback given by the EDC supervisor and class teachers about how to use the facility, while the last two concerned their reaction to the requirement to complete a specified number of hours in the EDC and whether they recommended it to all students. The response rate was quite high, with 45 out of 68 students returning the questionnaire. An overwhelming majority of students (93%) endorsed the role of the teachers, and especially the EDC supervisor, in helping and guiding them in using the EDC. Highly positive results were also obtained for the questions relating to the benefits of the EDC in improving their English skills (86% of respondents agreed); in learning new ways to improve their English (84% agreed) and helping them manage their English learning outside of class (71% agreed). In addition, 80% of respondents agreed they would use the ways for learning English practised in the EDC, in future. However, fewer students (60%) felt they had become more confident in using the language from their EDC experience. Opinion was much more divided concerning whether EDC hours should be compulsory, with a slight majority agreeing (53%, versus 23 % who said they should not). On the other hand, a significant majority (84%) agreed they would recommend the EDC for all students who wanted to improve their English. From the students’ generally favourable comments regarding the role of the EDC in helping improve their English skills, it appears our centre is scoring well on this aspect. Students also seem to have got the message about their improvement being dependent on their own efforts, rather than the teacher telling them what to do. Many have also embraced the concept of reading as more than just a text to be memorized, but a means of improving vocabulary, writing skills and even study skills. One described reading in the EDC as being “training for sit(ting) and study for more than one hour”. As medical students traditionally spend many hours a day poring over texts, this experience will be helpful for their future studies. Student active involvement in the centre is another positive result. Many opportunities are presented for students to better the environment in the EDC and take on some responsibility for their own and others’ learning. Although not all are confident about their ability to use English for communication, the highly positive response to discussion groups shows that many students have now gained the ability to “speak in English for a long time” as one put it, and deal with a variety of topics, something which is far from their high school experience. In addition, they have gained the opportunity to “be social with other students” as one remarked, a skill that will stand them in good stead as they share the demands of medical school in the coming years. In an earlier article in this journal, Lucy Cooker (2010, pp. 7- 8) described her principles for self-access, these being: self-access learning should be fun; learners should be involved in contributing to the centre, the learning environment should be comfortable for its users and perhaps most importantly, the facility should be truly ‘self-access’, i.e., students should not be required to use it. While I believe our centre has fulfilled the first three principles to varying extents, the issue of requiring students to attend is one I have struggled with since we established the centre. Are we interfering too much in student decision-making by asking them to provide and document evidence of their work, and by stipulating that they must spend a specified number of hours working in the centre in a given term? In providing some options such as discussion classes, are we actually managing their learning for them? In other words, are we really helping them become more independent, or are they still relying too much on their teacher/SAC supervisor to direct their learning? The line between providing support and making decisions for learners is one that is easy to cross, as student expectations based on their former training and the learning context are hard to ignore. In this aspect, students using our centre might benefit from counselling in learning strategies and self-assessment of their learning through modules or courses along the lines of those described in Kelly (1996) and Cooker (2010). On the other hand, the danger of providing too much support, especially when delivered as a required element of a formal course, in so-called independent learning, has also been noted. This may lead to students “going through the motions” to complete the requirement, without ever having the opportunity to experiment with their own pathways to learning (Morrison, 2009). Perhaps we can take reassurance about the current limitations of our facility from Gardner and Miller (1999), who point out that there are many different types of centres which evolve according to the needs of the learners. Among the examples they give (p. 53), ours can be categorized as something between a study centre and a drop-in centre. This is because it complements students’ classroom work, on the one hand, as the supervisor works closely with foundation teachers to augment their classroom materials and skills, and, on the other, it is a place where students can choose the activities they want from the materials available and according to their own interests and needs. The only difference is the stipulation that a certain number of hours be completed during the term. This requirement came about in the early years of the centre to draw students in, as there was little hope then of the ones most in need of supplementing their meagre English skills attending voluntarily. Once they were persuaded (or coerced) to visit the centre, resources such as graded readers and English language videos were a revelation, and they enthusiastically worked their way through what we had to offer, while many engaged the supervisor of the day in conversations, and pressed for more speaking opportunities which we tried to arrange. Whether they would have continued to come without being required to is debatable, but we suspect it would have been much more difficult to appeal to students without attaching some reward in the form of marks, given their prior training and expectations (Malcolm, 2000). The fact that our facility is lacking in the provision and updating of appropriate materials that can maintain student interest is tied to the relatively low profile the EDC has maintained so far, and the fact that we have no dedicated budget or official status as a university entity. To change for the better, we need to win greater administrative recognition of our centre and its important role. With the acceptance of an ever-increasing number of low proficiency students to the foundation course each year, we can certainly make the case for expansion, for a dedicated budget for updating resources, for increased staffing and, eventually, a purpose-built facility to serve the whole university. Thus, we will continue to bring student endorsement of the EDC to the attention of administrators, in the hope that we may play a more permanent and visible role in helping all who wish to improve their English skills. After all, the ultimate success and potential for growth of a self-access facility is its integration with and recognition by the rest of the institution (Dixon, 2006; Sturtridge, 2000). 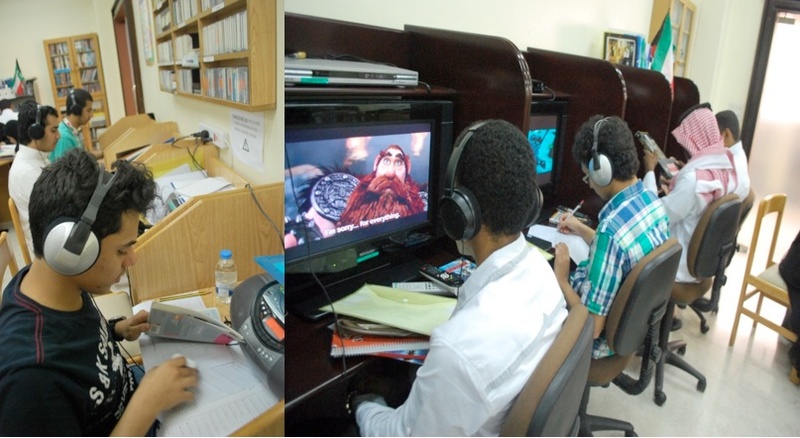 The self-access facility at a Gulf University has evolved to serve the needs of a specific group of Gulf Arab learners. We try to take into account these students’ background and prior exposure to and training in English while striving to reverse students’ perceptions that the onus for learning comes from the teacher. We also try to capitalize on their reward-oriented expectations by offering incentives for their achievements. In these respects, we consider our facility a success, and it certainly has become a second home for many ex-foundation students, now well into their medical studies, which they pursue in the same building. Nevertheless, there are a number of improvements we intend to make to further enhance their self-study environment and their learning. A priority is reconfiguring the space currently occupied by the EDC to increase its effectiveness, through studying the layouts of successful SACs in other settings, such as Kanda University, Japan, (Cooker, 2007) and taking cues from those to adapt our facility, by, for example, adding a sound-proof space for discussions and movie viewing, and rearranging the different centres for various skills practice. We have recently been assured of administrative support from the AGU president to do this, and have also attracted the interest and participation of a new group of users, postgraduate students in various specialized fields such as Arid Sciences and Education which are also offered at our institution. These are encouraging indicators that the important role of the EDC in helping students with their English proficiency is increasingly being recognized. Above all, student input will continue to be valued, both as a source of encouragement and assurance that we are on the right path, and to remind us of the work that still lies ahead. Diane Malcolm is English Unit Head at Arabian Gulf University (AGU), Bahrain, where she has taught first-year medical students for over 25 years. She established the AGU English Unit self-access centre in 1998, and has coordinated its activities since then. Mohamed Majed has been the self-access facility supervisor at Arabian Gulf University (AGU), Bahrain, since 2011. Dixon, D. (2006). Why have an independent learning centre? In D. Dixon, H. Baba, P. Cozens, & M. Thomas (Eds. ), Independent learning schemes: A practical approach (pp. 45-58). Dubai, UAE: TESOL Arabia. Cooker, L. (2007). The Self-Access Learning Centre at Kanda University of International Studies (KUIS), Chiba, Japan. Independence, Newsletter of the IATEFL Learner Autonomy Special Interest Group, 41, 29-32. Gorevanova, A., & Gulyamova, J. (2009). The supported open learning centre (SOLC) at the British Council, Uzbekistan. Independence, Newsletter of the IATEFL Learner Autonomy Special Interest Group, 45, 25-29. Kelly, R. (1996). Language counseling for learner autonomy: The skilled helper in self-access learning. In R. Pemberton, E. S. L. Li, W. W. F. Or, & H. D. Pierson (Eds. ), Taking control: Autonomy in language learning (pp. 93- 114). Hong Kong: Hong Kong University Press. Malcolm, D. (2000). Giving credit where it’s due: Self-directed learning and marks. Independence, Newsletter of the IATEFL Learner Autonomy Special Interest Group, 28, 10-13. Morrison, B. (2009). From the thrill of drilling to the dangers of scaffolding. Independence, Newsletter of the IATEFL Learner Autonomy Special Interest Group, 46, 25-26. Pemberton, R., Li, E. S. L., Or, W. W. F., & Pierson, H. D. (Eds.). (1996). Taking control: Autonomy in language learning. Hong Kong: Hong Kong University Press. Qashoa, S. (2006). Motivation among learners of English in the secondary schools in the Eastern Coast of the UAE (Unpublished master’s thesis). British University in Dubai, UAE. Rabab’ah, G. (2002). Communication problems facing Arab learners of English. Journal of Language and Learning, 3(1), 180-197. Shih, Y.-L. (2007). The self-access centre at Soochow University, Taiwan. Independence, Newsletter of the IATEFL Learner Autonomy Special Interest Group, 40, 37-40.